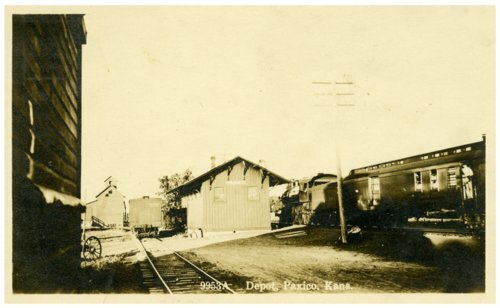 This postcard shows the Chicago, Rock Island and Pacific Railway depot in Paxico, Kansas. To the right one can see a passenger train, to the left a freight boxcar, and the grain elevator in the distance. The postcard is addressed to Mrs. J. W. DeGroff at 1046 Washburn Avenue in Topeka, Kansas.